Room is clean, and the bathroom had a giant Japanese style tile bath tub. Convenient location to Taipei 101. Arthur, the Concierge at the time of our stay, really went out of his way to assist and take care of our needs. It greatly helps that he speaks good English so we were able to really converse well with him. Location is great! Just walking distance from Taipei 101, subway, WTC, TICC, Grand Hyatt. The staff were friendly and accommodating. You can dial the counter and ask for refill of bottled waters and toiletries such as soap, toothbrushes, etc. The location is perfect for visitors of Taipei 101 or the World Trade Center Exhibition halls. Great location! Woman working downstairs was the most kind/sweet person. She was there very early and late at night every day! I liked that the hotel was located near a bus stop. (relatively close like a 10 minute walk). you can take the bus from the airport to the grand hyatt and from there you can walk the rest of the way to the hotel. 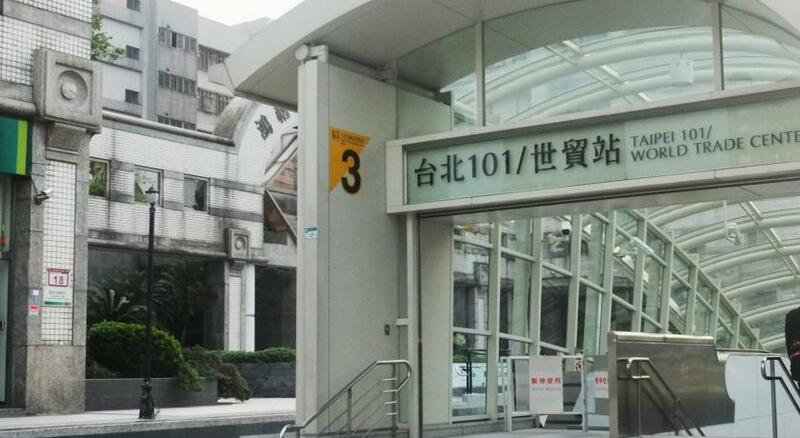 Location accessible to Taipei 101, train, convenient store, bakery and restaurants. Personal touch of the front desk personnel, Cherry and the cleaning lady who never stops working. HolyPro Hotel This rating is a reflection of how the property compares to the industry standard when it comes to price, facilities and services available. It's based on a self-evaluation by the property. Use this rating to help choose your stay! Located in the Xinyi Business District, this boutique hotel is a 3-minute walk from the Taipei International Convention Center and Taipei World Trade Center. It offers stylish rooms with free Wi-Fi access. HolyPro Hotel is a 10-minute walk from the Taipei City Hall Metro Station. It is a 10-minute train-ride from Taipei Main Station. Taoyuan International Airport is a 45-minute drive away. Fitted with tiled flooring, air-conditioned rooms feature a flat-screen TV with cable channels, a mini-bar and an private bathroom. 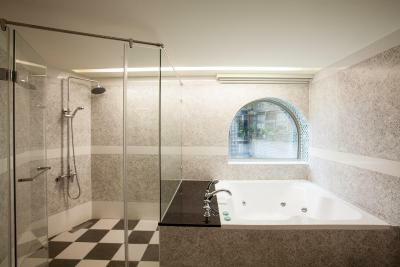 Select rooms have a spa bath. Guests can take a 10-minute stroll to Tonghua Night Market, where street food and shopping options are available. HolyPro’s reception staff can assist with tour arrangement and luggage storage services. Fax/photocopying services are also available. Xinyi District is a great choice for travelers interested in city trips, culture and gourmet food. When would you like to stay at HolyPro Hotel? Along with tiled floors, air-conditioned rooms feature a flat-screen TV with cable channels, a minibar and a private bathroom. Along with tile floors, air-conditioned rooms feature a flat-screen TV with cable channels, a minibar and a private bathroom. These larger rooms have a spa bathtub. These larger rooms have a bathtub. These larger rooms come with 2 single beds. Room features a large double bed and a whirlpool bathtub for 2 guests. Room with 2 double beds for 4 guests. Hotel surroundings – This neighborhood is a great choice for travelers interested in city trips, culture and gourmet food – Check location Great location - show map Guests loved walking around the neighborhood! House Rules HolyPro Hotel takes special requests – add in the next step! One child under 12 years is charged TWD 600 per night when using existing beds. All children under 12 years are charged TWD 1000 per night for extra beds. Any additional older children or adults are charged TWD 1000 per night for extra beds. HolyPro Hotel accepts these cards and reserves the right to temporarily hold an amount prior to arrival. Without drawer. Only one charger in the room. Space is too small! Room clean is after 12:00pm. Once booked, it will not be canceled freely. The price is a little bit higher based on the facilities! Bed was good enough, not too soft not too hard. no window in the room. the bathroom door is clear you can see thru. location is great. good size of room. The property blocked my credit card before I went to travel. When I arrived, they charged me again. They said they didn’t blocked , my credit card company blocked automatically. When I came back to my country, I called the bank company. The bank said “it was the onwer of hotel blocking”. I need to use money in credit card while traveling. They made me in trouble. I wanna know if they blocked , why do we have to pay for the hotel again? if we didn’t have to pay, we could spend much money during traveling. Service was terrible. I stayed with my partner and she absolutely hated the hotel. If you have a partner who needs a fancier hotel for the money do not choose this place. It was also a real pain to get the hotel to provide room cleaning services. check in time was very very strict like seriously ! and they had a room avalible but the receptionist just would not let us check in until 3 pm. The hair dryer would stop working, it didn’t run constantly, so I had to wait until it came back on again. Not convenient.